the civil registration system, the system through which we get our certificates of births and deaths. The civil registration system in India begins with the village accountant at the village level, with designated officials at each of the block/taluka and district offices. Entire departments are dedicated to this enterprise at the state level. In Karnataka, for example, in each of its 30 districts’ zilla panchayat offices, every year, the district statistical officer totals up the births and deaths reported the previous year from all the villages in the district. Certificates of births and deaths issued in villages record vital events. In addition, they also record the probable cause (in the case of deaths) and such information is routinely sent upwards to the district level in paper reporting formats, and collated for annual state level reports of births and deaths. In most of our states, an entire department headed by a chief registrar of births and deaths oversees this massive enterprise. As a parallel enterprise of creating a unique identity for each Indian citizen is going on, one would imagine that sufficient effort has gone into making use of this elaborate information being collected through this system. Access to the information collected through this system is crucial, for instance, for health planning. It could also contribute to the analysis of health outcomes of disadvantaged communities. Researchers or journalists could use this data to analyse and engage in discussions on public policy and reflect on the impact of policies and reforms in particular districts or regions. Unfortunately, it turns out that such information is not even available to the government themselves, let alone journalists or researchers. At least, the information is not in a format that is usable by them for decision- and policymaking. Village-level data that come in paper formats are totalled and sent in prescribed formats to the state level, and produced as reports that are published on the websites. In the absence of computerisation or at least, entry of such important data into a database, a district health officer cannot obtain disaggregated data on the types of deaths in a particular block or village, or among people below the poverty line. Officers can only get state-level totals based on the format prescribed under the Act. All other data, though available, are lost in totalling. 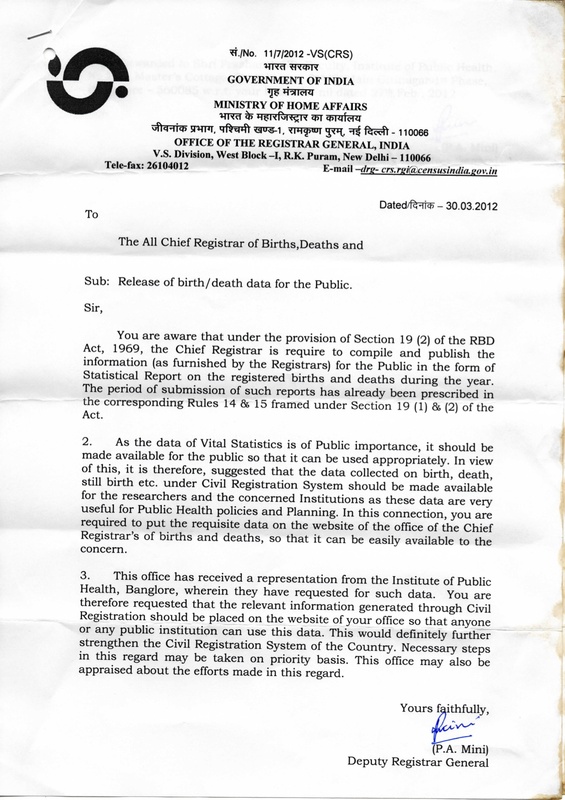 In response to a campaign using RTI queries, I met with denial of information, not because it was not collected, but because the collected information was lost in a process of completing paperwork prescribed by the births and deaths registration Act, and the bureaucratic procedures of producing annual reports, instead of putting the data out in public domain. In response to a letter I wrote to the registrar general of India, there was a direction to all the chief registrars of states to put in place steps to make this data easily accessible to health care workers and policymakers. Over a year has passed since the letter. The data continue to be collected, aggregated and the effort wasted since no disaggregated data is available to the health system or the public. It is time to take a moment and ask why we collect information on births and deaths in this elaborate manner. In India, the foundation for the civil registration system was laid by the then colonial British administration following millions of deaths in the Great Indian Famine (1876-78). Subsequently, independent India passed its own Act in 1969, making reporting of births and deaths mandatory. The information collected by the mammoth enterprise ranging from the registrar general of India in Delhi to the village accountant in each of our villages, meticulously record births and deaths. However, the entire system is focused only on producing the reports in the particular format stipulated by the Act. Below that level, all the information is totalled up without any effort for creating a database that can be used by the government itself, if not by researchers or journalists. Accurate information on causes of death can help build an effective health policy. For instance, routine data from civil registration in the UK contributed in identifying the causal association between smoking and lung cancer in the 1950s. Due to the lack of a database of vital statistics based on our civil registration systems, the long-term social, economic, and demographic impact of major diseases in India can only be estimated from statistical models or resource-intensive surveys. Ranging from a lack of awareness among people on one hand, to poor demand from policymakers on the other, many issues plague the Indian civil registration system. However, there appears to be a lack of vision in taking forward our archaic registration system beyond its colonial origins into the information age. We must make the information we collect available in a disaggregated manner, making it available for health care workers, policy makers, journalists and citizens. Can we count on our counting systems? A shorter version of this article appeared on BMJ Blogs on October 31, 2013 under the same title. Co-written with Himabindu G L of IPH, Bangalore. discourse. The system through which governments record vital events such as births and deaths is the civil registration system. Defined by the United Nations as “the continuous, permanent, compulsory and universal recording of the occurrence and characteristics of vital events”, it forms the basis for identity, citizenship and civil rights. Established perhaps first by Sweden, as early as 1631, its importance was globally recognised and more countries have worked towards establishment of efficient and comprehensive civil registration systems.